...a NeoLemmix [custom Lemmings] level pack by Clam. maintained by mobius and Wafflem. FOR USE WITH THE LATEST NEW FORMAT VERSION OF NEOLEMMIX. These levels were compiled from Lemmix, Lix and some contests from 2008 onward. after following this link; download the "Latest experimental NeoLemmix Player V11.15.24"
Includes all the graphic sets needed for the pack, including Insane Steve's IS World and Johannes's Droidlings City. Place the styles folder in the NeoLemmix folder. 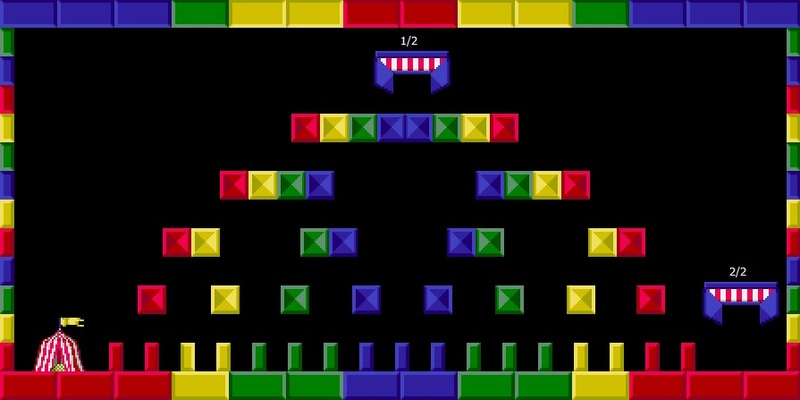 -Start NeoLemmix and press F2; select "Clammings" from the list and select a level to begin playing! Feel free to leave comments or post replays. If you have problems please post with questions. We will continue to update this pack when back-routes are found or issues are fixed. Intended solutions to every level can be found in the "solutions" folder. This pack has no talismans. 1. a glitch in NL causes the marquee on the main page to not display properly. 2. OH NO! MORE WEE CREATURES has a backroute that cannot be fixed. Wafflem for sharing a lot of the workload; making fonts, background and sign images, music, converting and fixing graphics, testing, level creation and fixing, and being very helpful and encouraging for this project. IchoTolot and Nessy for making/converting graphic sets and testing. and of course: Clam for making the levels! 1/6/2018 - version2: typo fixed to Insane 4.
a. Coming down alive and Sand Me Down Swapped. b. Over and Under and Out moved to Arcane 14; A step two far moved to Arcane 5; Interval Training moved to Arcane 4. -Lem Squared, Square Squabble, Pick Me Up and Training Zone Alpha have been redone and should work correctly without any extra tilesets. -Changed the music in "Catch Your Death" and "Lem Squared". fixed typo in "Advanced Altitude Training"
a number of music changes in the music pack and in levels. And some minor graphical changes. Clammings also uses a custom graphic set that has not yet been released with the latest experimental version of NeoLemmix: Proxima's Minesweeper set. You can download it in the attachment below; extract this ZIP in to the same folder as the styles folder. Minesweeper attachment removed as Proxima needs to make a fix to his Minesweeper set. Also, a minor typo I found: Insane 4 "Altitude Training" should be titled "Advanced Altitude Training". Thanks again for letting me work with you on this pack, mobius! It was a lot of fun helping you out! Are all the levels possible now? As I was solving myself through the last rank of the pack I got stuck on impossible levels due to the changed ceiling behavior! I checked them out in Lix, because I had a feeling and noticed they have a solid terrain ceiling there -- the now deadly ceiling made the NL conversion impossible as the solid ceiling was used actively here. @Wafflem; thank you for the style; I forgot this wasn't released yet. I fixed the initial post so you may download the style there too. @Icho; yes all levels are possible. When you played the pack it wasn't finished and it's been worked on quite a bit since then. You can run the mass replay checker to make sure. The folder "solutions" has a replay for every single level. updated to fix the typo. I don't know how to fix "Oh no more wee creatures"; I'm not real concerned with it atm; Icho's solutions isn't trivial. Also I added pretty pics to the main post! Version 3 is now out! mobius decided that since the Minesweeper graphic set is currently unavailable that we remake the levels using that set into ones that are available with NeoLemmix. Thanks for keeping me informed. I had intended to talk to mobius about this, but we never managed to find a time when we were both online in between your stream and now. I'm a little annoyed that the set was originally posted here without consulting me, but that's in the past now. The important thing now is to finish the set so it's ready for release and okay to be used, especially as I know you and Flopsy are using it in MegSEGABytes (if I have that name right) and I'm anxious not to spoil that. So, I'll get the set fixed up as soon as I can. Flopsy has sent me the level in question, so I'll tweak it so it works with the fixed set (this will not be a problem, mostly just replacing the single-piece frame with separate pieces) and send it back to Flopsy privately; I hope that's okay with you two. As for the Clammings levels, I'll speak to mobius when I can, but I hope he will reconsider, although I accept that ultimately it's his and your decision. I apologize for all the confusion; I should have made a topic about the minesweeper set, apart from just uploading it in this thread to make things clearer. And thinking about it; it's better than nobody has to download a new style from this topic here. Now it's working without needing to download anything extra, or new styles. As the ISWorld set is also available elsewhere. And for anyone who read through the whole thread; since this pack was uploaded here, it was never incomplete/unsolvable; all levels were solvable and working with what was downloadable here. For the record: I distinctly remember asking you about it on IRC and I thought you were okay with it. Sorry if I misunderstood. Except for "Pick Me Up" These levels I had already made in another set previously so it wasn't really any work to remake them. And I didn't want the set to be in an incomplete state, nor anyone else to have to hurry/work to fix my mistake. We can change the levels back if the set is released on it's own (like the other sets have been) and is stable. I personally don't mind if changes are made to it later; I'm willing to fix/make changes to any levels that would need them. I finished Humane and Arcane. awesome, thank you! It will take me a while to look through all these, but I will post in due time about any fixes that may need to be made. I completed the Insane rank. I looked at Insane's replays so far. Interesting alternate solution to "Rounds and Swingabouts"! slightly alternate solution to 20 which I don't think can be removed. your replays for level 13 (Evacuating a Retirement Home) Does not solve the level for me. *Santa's Workshop: intended solution has been altered. the following weren't fixed; Insane 8 and 14 because I have no simple or clean looking way. The other alternate solutions are allowed. Also congratulations, Josh, you're the first person (to my knowledge) to have solved From the Brink the intended way!